A deadly shooting at California bar has left 13 dead. The gunman was identified as U.S. Marine veteran Ian David Long, age 28. In a country-western bar on in Thousand Oaks, California the gunman on Wednesday night and shot dead 12 people, including a sheriff's sergeant, before killing himself. Ventura County Sheriff Geoff Dean said Long, 28, was found dead in the Borderline Bar & Grill in Thousand Oaks late Wednesday. It's believed he killed himself. 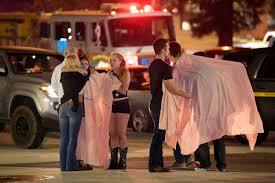 The gunman opened fire around 11:20 p.m. PT at the crowded country-and-western bar. Police said hundreds were inside at the time. The first officer inside the door, sheriff's sergeant was also killed. Sgt. Ron Helus was shot multiple times as he entered the building and was a 29-year veteran of the force. Dean said around 10 other people were injured and taken to local hospitals. The gunman acted alone, and had a handgun. The bar is a popular hangout for students from nearby California Lutheran University. Cal Lutheran, with about 4,300 students. The school has cancelled classes and invited the university community to gather for prayers on Thursday at the school's chapel.